I’ve had some feedback from followers on the East Coast lately that I keep blogging wines that no one can find there. So for this entry, I am going in the extreme opposite direction. I am blogging a wine that you can find EVERYWHERE. This wine is purple in color of course, because it is as young as it can get. It smells like a raspberry fruit roll up – juicy and candyesque. And that is exactly how it tastes – like fruit punch and raspberry Jello. Beaujolais Nouveau is not meant to be taken seriously, and I just like the tradition of the day – I’m a fan of any day that is dedicated to celebrating the release of a wine! So this tastes fruity, fruity, fruity, and the finish is pretty much non-existant. But – as promised – I’m trying it with turkey. This wine actually was great with turkey, but hold the cranberry because if you have it with turkey AND cranberry you might as well just have dessert – sweetness overload. If your turkey comes out dry, find this wine because this wine is nowhere close to dry. In fact, just pour the bottle over the dry turkey! Kidding. But I think this wine would be great with those turkey sandwiches you will make from the leftovers. Or some turkey pot pie. Try THIS recipe with your leftover turkey – it is killer. No score. 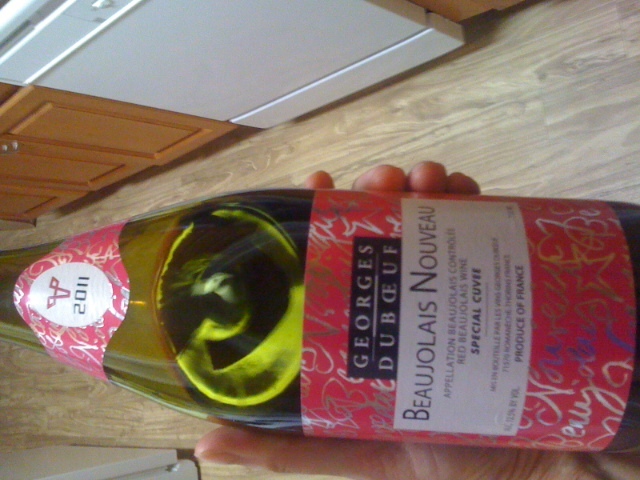 Just for fun :-) Happy Beaujolais Day!